Did you know that your Cricut Explore can cut an insane variety of materials? The custom material settings in Design Space is something that you will need to be familiar with if you want to cut things that are different from the basic paper, cardstock, vinyl, etc. In this tutorial I will show you how to use the custom material settings when cutting with your Cricut Explore, as well as how to adjust the setting for different materials. This post contains some affiliate links for your convenience (which means if you make a purchase after clicking a link I will earn a small commission but it won't cost you anything extra)! You can read our full disclosure policy here. I've chosen this "good stuff" image by Heidi Swapp as an example. Once you have the image you want and are ready to cut, select "Make it" in the top right corner. Make sure the dial on your Cricut Explore is turned to "custom" and then select "continue" in the bottom right corner. The first step says "set material" and prompts you to select one of the materials shown. If you are cutting something that is not on that screen, select "view all" to see the complete list. Once the full list comes up, the materials will be separated by type. You can filter by categories using the drop down menu on the left. You can also search for a specific material using the search bar on the right. Once you have the material selected that you want to use, there will be a dropdown menu where you can select more or less pressure. This is so nice to have the option to make this adjustment! If you have been using a blade for a while and it has started to wear out, you may need a tad more pressure. If you have a brand new blade, you may need to select less so it will have slightly less pressure than normal. When you find you are cutting a little too deep or not quite enough, adjust this setting and see if it helps. Next, it will show which blade you should be using. The fine-point blade is the standard German Carbide blade that the Explore comes with. You can also use the deep cut blade, or "deep-point" as it is labeled here. 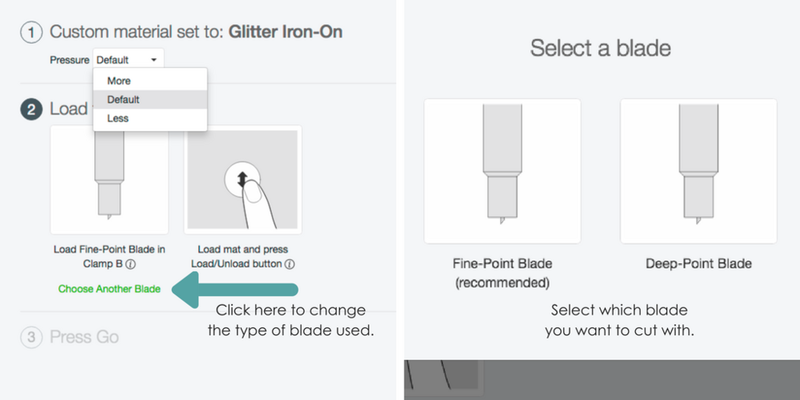 If you want to use a different blade than selected, click on the "choose another blade" link. It will prompt you to select which blade you want to use. You will load the mat and finish out the cut as normal. There may be a material you are cutting that you want to add or adjust the settings for. At the bottom left of the screen select the "material settings" link. Each material has three settings: cut pressure, multi-cut and blade type. Once you find the material you want to change, select the edit button to the right of the material. The multi-cut has a drop down menu where you can select if you want the machine to cut more than once and how many times. There is a slider bar where you can drag to change the pressure amount of the blade. You can also choose the blade type from the drop-down menu. Once you adjust the settings and save them for a specific material, every time you select that material it will cut with the settings you entered. Using custom material settings in Design Space 3 when cutting with your Cricut Explore is a more advanced feature that really allows you to master your machine and ensure it cuts just as you need it to. The trial and error of figuring out what settings work best for what you cut can have a bit of a learning curve at first, but it is so worth it once realize the options are nearly endless. Do you use the custom material settings on your machine? Leave a comment below and tell me how you use the custom setting when you create. CRICUT TIPS & TRICKS, TUTORIALS AND SPECIAL DEALS STRAIGHT TO YOUR INBOX! Awesome! I can't wait to connect with you! It's super important that you go to your email and confirm that it is really you who wants more Cricut goodness in your inbox.